Festival season is in full swing now my friends and I couldn’t be happier about it. Even though I’m not a camper (soz if this doesn’t make me a proper festival go-er), I still absolutely love spending the day in the sun, covered in glitter, wearing super colourful clothes. So, I thought I’d share a few makeup bits I’ll be wearing on for Citadel, which is this Sunday eeee! I feel like the thing that completes a makeup look is the eyeshadow and for me, its usually the main focus. As this is festival makeup, I think glitter is obligatory. 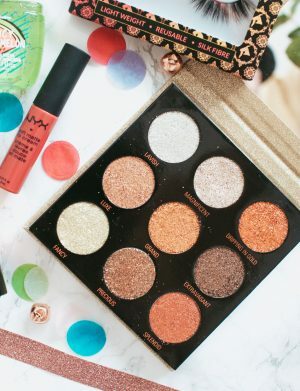 This stunning Makeup Revolution Pressed Glitter Eyeshadow Palette is perfect for creating that festival go-er look and adding something a lil bit extra. You do have to be quite careful when applying these glitters because of course, it gets everywhere. 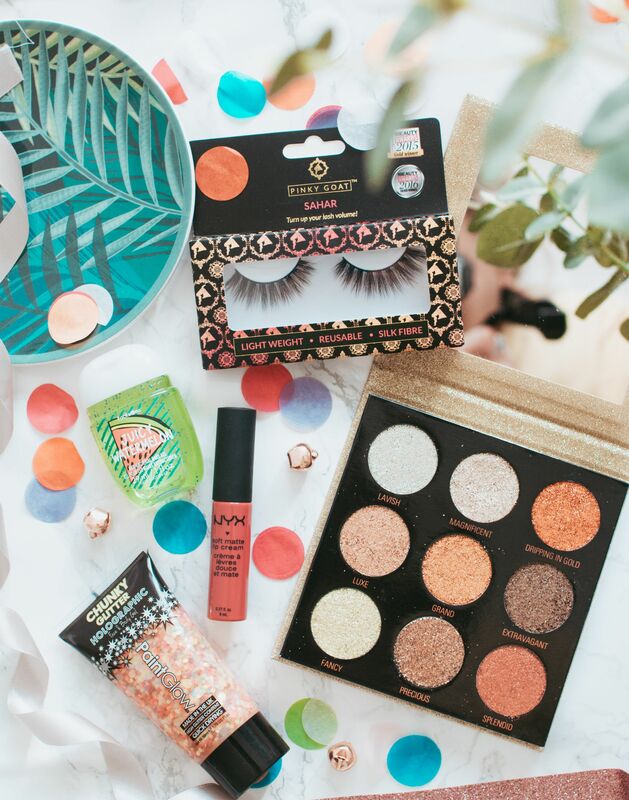 If you’re gonna go all out with the glitter eye look, falsies are a must to finish it all off. I’ll be wearing these gorgeous Pinky Goat Lashes in Sahar*, I love these because they’re really fluttery but still very lightweight. Moving away from the eyes and onto base. I plan on doing my usual routine to complete my base, but maybe add in a little more NARS Copacabana into my foundation, because the more glow the better, right?! Ooh and I’ll also make sure I add an extra bit of highlight. Of course, this wouldn’t be a proper festival makeup look without adding ALL the glitter to my cheeks. I picked up the PaintGlow Holographic Glitter Body Gel because I mean, look at it! This is gonna be plastered all across my cheeks and probably on my chest and arms too, because when else can you do that and get away with it?! So, it looks like I’m going to be glittered up to the eyeballs (literally) and I love it. Finally, I’m torn between going for a bright lip or keeping it neutral. I guess it depends on my outfit, which I still haven’t decided on yet…sigh. However, my trusty NYX Soft Matte Lip Cream in Prague is on the cards, because you can’t beat a bright pink lip can ya? !